In the early European development and settlement of North America there were numerous wars between two major European powers: English and French. Once the French were defeated in the French and Indian Wars, then it became the English and the American Colonists that found themselves in not just one war, but two: the American Revolution and the War of 1812, when Britain tried once again to regain the lands she lost during the Revolution. During this time the Wyandotte Indian Nation who were spread up and down the Sandusky River in the late 1700s, having been previously forced out of Canada by the Iroquois, found themselves aligning with different powers depending on who paid them the most and which side they considered to be most likely to win. From the French in the early trading wars to the British then back to the French during the French and Indian War and then back once again to the British during the American Revolution. And In the War of 1812 half of the Wyandottes sided with the American forces against the British and the other half sided with the British. When the War of 1812 came to an end, the Wyandottes settled down, and concentrated their nation near where Upper Sandusky is today. Along with them, was a group of African-Americans who also settled nearby. This group was comprised of both free blacks and escaped slaves. Together they lived in a somewhat harmonious manner. The Wyandottes who had always been farmers, worked with the blacks, and the blacks in turn worked with them. Part of this intermingling led to some of the Wyandottes accepting Christianity and forsaking their Native customs. This in turn led to limited perks granted by the federal government. One of those perks was some money to build a mill. In 1820 a flour mill and sawmill were both constructed on the banks of the Sandusky River by the United States government. These mills provided important services for the Wyandotte farmers and the blacks living in the area. They were able to process their harvests and turn logs into timber to build their homes. However, under pressure from many white settlers that lived in the area immediately surround the Wyandotte reservation, the federal government finally decided to permanently remove the Wyandottes out of Ohio. While the removal took several years, the final result was that the Wyandottes left. When the last of the Wyandottes left the area, the settlers destroyed most of their culture, including their houses, churches, even going so far as to destroy the headstones in the cemeteries. The mill fell into disrepair and was abandoned. 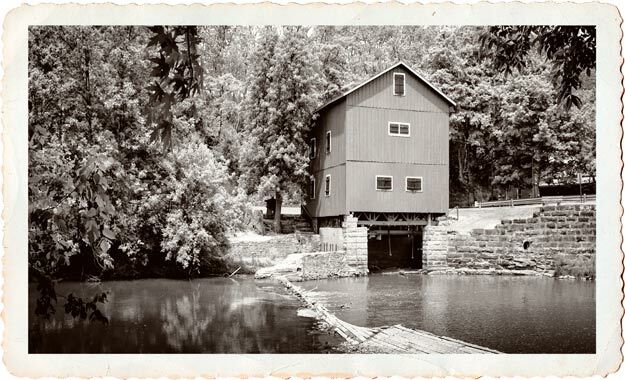 Some years later, the flour mill was re-built on the present site by Lewis Rummel. He used 3 Leffel turbines in his new mill. 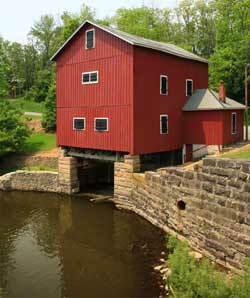 The turbines were manufactured by James Leffel and were a new innovation to milling. The mill has been owned my various people over the years and was purchased by the Ohio Historical Society in 1968. 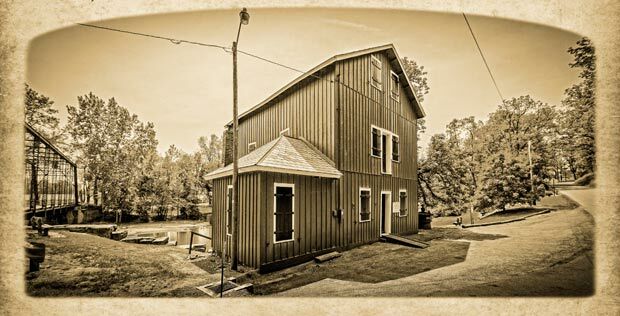 Today, the Indian Mill is our Nations first educational museum dedicated to the milling process. Through education and demonstrations the ways of milling from prehistoric times, to present day methods are presented. If you have an interest in how milling is done this is the place for you. Indian Mill can be found 3 miles northeast of Upper Sandusky, along County Road 47 along the Sandusky River. While visiting the museum be sure to walk across the old iron bridge and enjoy a picnic in the shaded park. Listening to the waterfall, enjoying a cool summer breeze while viewing the scenic mill from across the river is just relaxing and is alone worth the trip. James Leffel was a second generation miller from Virginia. He settled in Springfield Ohio and continued his search for improving milling production. He added a machine shop and foundry to his mill. In his foundry he began making stoves and was thus the first stove maker in Ohio. With the Civil War an increase in flour production was needed. In 1862 Mr. Leffel introduced the American Double Turbine. Gristmills using his turbines were able to double their production. The Leffel Company still operates today producing hydraulic turbines in Springfield Ohio.